Forgive me for starting this workshop with a shameless name drop. For reasons totally unrelated to G&B, I recently found myself spending an afternoon with Joe Bonamassa. The conversation turned to guitars and amps and he let slip that he plays tweed Fender Supers at home. Joe described how the late-50s Super, Bandmaster and Pro models all share the same circuit but, in his words, the Super is “the one to get”. The differences between these amps are the output transformers, feedback components and speaker configurations, but all are more or less lower-powered versions of the late-50s Bassmans and Twins Joe currently plays on stage. 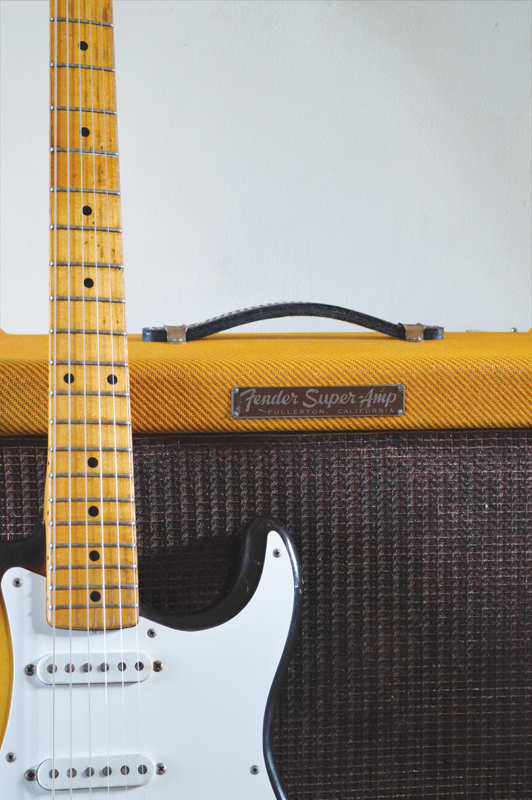 The Super is the smallest and rarest of the bunch; it was also Leo Fender’s personal favourite – and many vintage tweed aficionados share his opinion. Treble and bass controls allow more tone shaping than you get with smaller tweeds such as the Princeton, Harvard and Deluxe. Better still, around 30 watts of power through a pair of 10-inch speakers makes a Super loud enough to use with a drummer and you can still crank one up for tube overdrive at smaller gigs. The only downside is that they can be expensive and hard to find. I relayed this conversation to my mate Ed. He’s a huge Bonamassa fan who contracted a serious tweed bug when I fixed up his ’57 Vibrolux in the October issue of G&B. What followed was a period of research, which largely involved me poring over schematics while Ed sent over forum links and YouTube demos. I probably shouldn’t have been surprised when he eventually showed up with a tweed Super and asked me to ‘sort it out’. 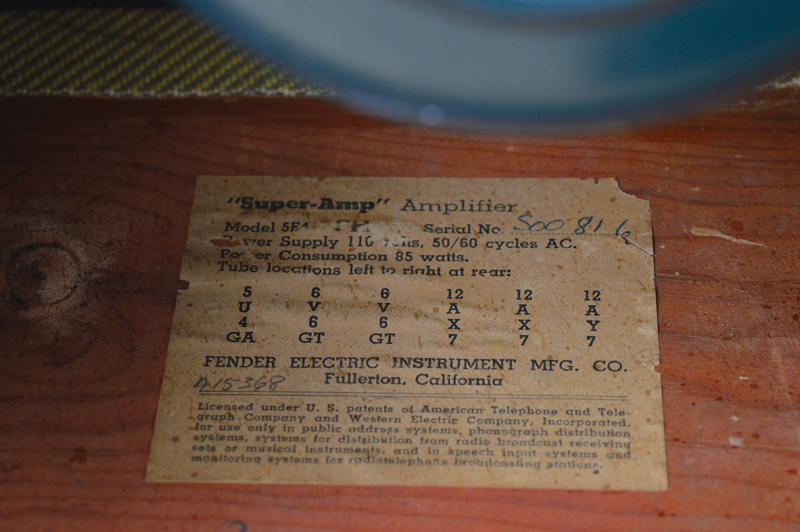 Vintage Fender amp model designations can be confusing, but they work something like this: the model codes were usually written or stamped onto a tube chart that was pasted to an inside wall of the cabinet. If the first digit is a 5, this tells you it was made in the 50s. The second digit is a letter, which tells you which model amp you’re dealing with, and the final digit is a number that corresponds with the model name. A number 3 corresponds with Deluxe amps, so a tweed Deluxe made around 1950 would be a 5A3. As the Deluxe evolved throughout the decade, the model designation changed to 5B3, 5C3, 5D3 and finally the famous 5E3. The number 4 corresponds to a Super and the tube chart code on Ed’s example reads 5E4 followed by the letters ‘FH’, which means a manufacturing date of August 1956. 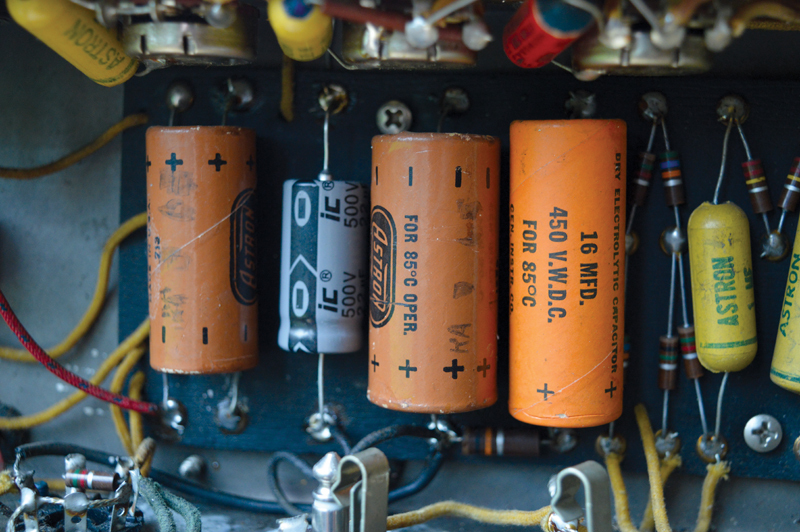 The serial number on the tube chart matches the stamped number on the amp chassis and the ‘FH’ stamp denotes August 1956. A 5E4 should have a 12AY7 in the second position, but this chart specifies a 12AX7. Packing a pair of fixed bias 6L6 power valves meant Supers were a step up from the Deluxe, but for a brief period in early 1956 Supers were equipped with 6V6s. The 22-watt 6V6 Super had two models – the 5E4 and 5E4-A. Having examined the schematics, the only difference seems to be a change in the value of the resistor connecting the bias resistor to the output transformer from 22K to 18K. The power transformer on the left is an 8160, the choke is a 14684 and the output transformer on the right is an 1848. All three are original and correct for 5E4 and 5E4-A Fender Supers. 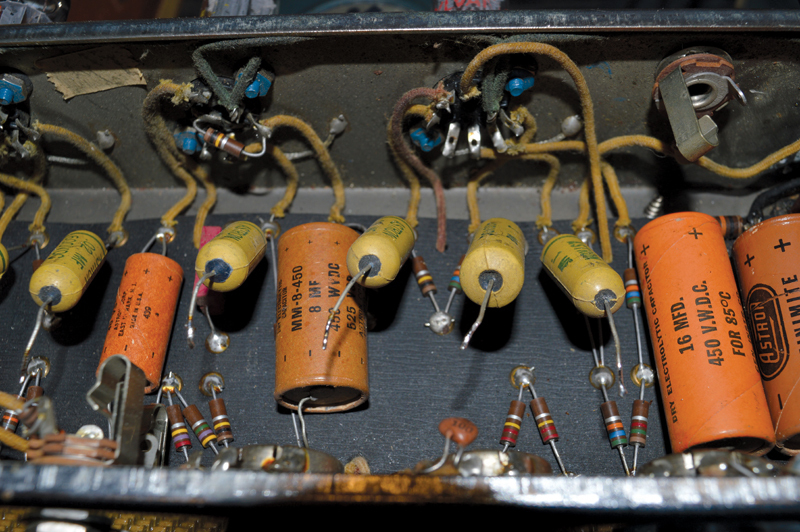 The 6V6 Supers preceded the final 5F4 version, for which Fender reverted to 6L6s with a beefier power transformer, a 12AX7 in the second preamp stage and another resistor change from 18K to 6K8. In all other respects, the circuits were identical. Ed’s Super combines features from the earlier 5E4-A and the 5F4. The tube chart does specify 6V6 power valves, but also the 12AY7/12AX7/12AX7 preamp valve configuration of the 5F4. It has the Triad 8160 power transformer associated with the 6V6-loaded 5E4-A, but the bias resistor is a 6L6-spec 6K8. The 5F4 schematic showed a 0.05uF capacitor connected between the standby switch and ground. It’s not shown on the 5E4-A schematic, but even so this Super had the standby switch cap. My guess is it’s a transitional version of the 5E4-A, which was itself a transitional model. The bias components include the red square selenium diode and the fat orange 100uF capacitor. The resistor at the top is a correct-spec 56K, but the 6K8 resistor shouldn’t be there. Working on valve amplifiers can be lethal and it’s most risky when they’re not earthed. Ed’s amp arrived with its original two-conductor mains cable, so I had to replace it with a modern twin and earth mains cable before starting any other work. Tweed amps of this era have a ground switch that is coupled to a capacitor. The mains wires are connected either side of the ground switch on the left and the ‘death cap’ is lurking beneath. The other yellow cap is connected to the standby switch. It’s not shown on the 5E4 or 5E4-A schematic but appears on the 5F4 schematic. This capacitor is popularly known as the ‘death cap’ because if it fails there’s a possibility you will be electrocuted. 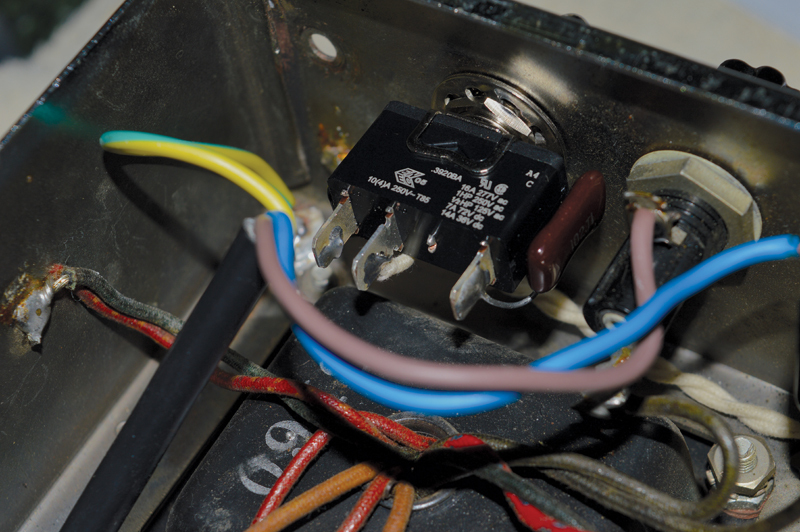 That capacitor needs to be removed and the ground switch will be taken out of circuit, but before doing anything you must ensure the amp is not connected to the mains supply and all the capacitors have been discharged. The mains cable insulation was rotting away and flaking off. Some collectors prefer to leave the original mains cable and death cap intact. G&B wishes them all good luck with that. The trickiest part is removing the original cable. The strain relief collar must be squeezed with pliers inside the chassis then pushed through the hole. Once removed, it should come off the cable easily and you will be able to reuse it. I exposed about 10cm of the conductors then stripped about 5mm of insulation from the ends to expose the copper. I tinned the ends with solder then soldered the ground wire to a sturdy tag and clasped it firmly to the chassis using one of the power transformer bolts. 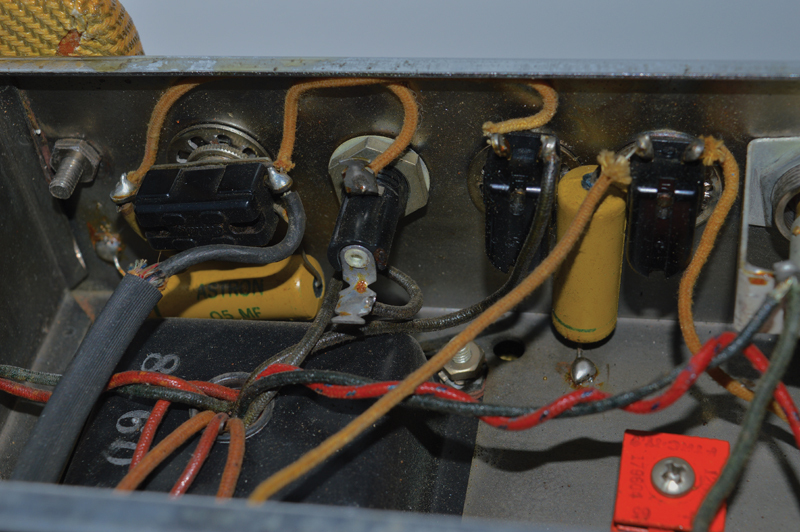 The live and neutral wires were soldered directly to the fuse holder and the power switch. The new mains cable is soldered directly onto the power switch and fuse holder, and the ground switch and death cap have been removed. The standby switch capacitor was installed to eliminate switching noise. Having a 60-year-old capacitor with 415v at one end and the chassis at the other seemed reckless, so out it came. It’s also worth noting that the original mains cable’s insulation had dried out and started to disintegrate. If you prefer to see vintage amps with original mains cable, I wish you luck. The amp was working when it arrived and sounded strong and loud. However, it was a bit crackly and the overdrive had a slightly raspy quality with an uneven decay. Initially, we assumed the original Jensen speakers were shagged out, but trying the Super through an external cabinet showed that the problems lay inside the amp. Having installed an earthed mains cable, I felt safe enough to run some preliminary health checks. 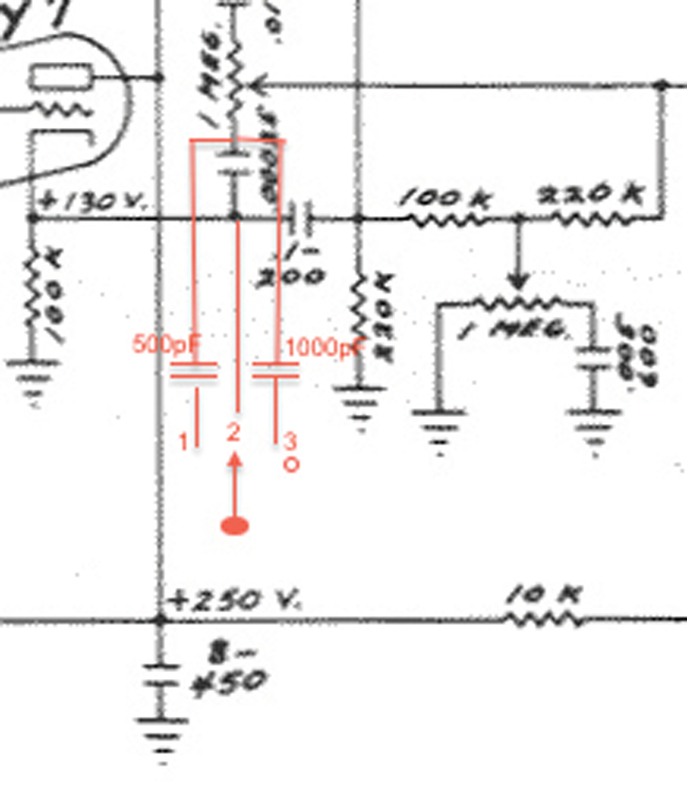 All the voltages tested higher than the values specified on the schematic, but within Fender’s margins of tolerance. The schematic shows 385v immediately after the choke, but I was reading 435v, which is quite high for 6V6s. 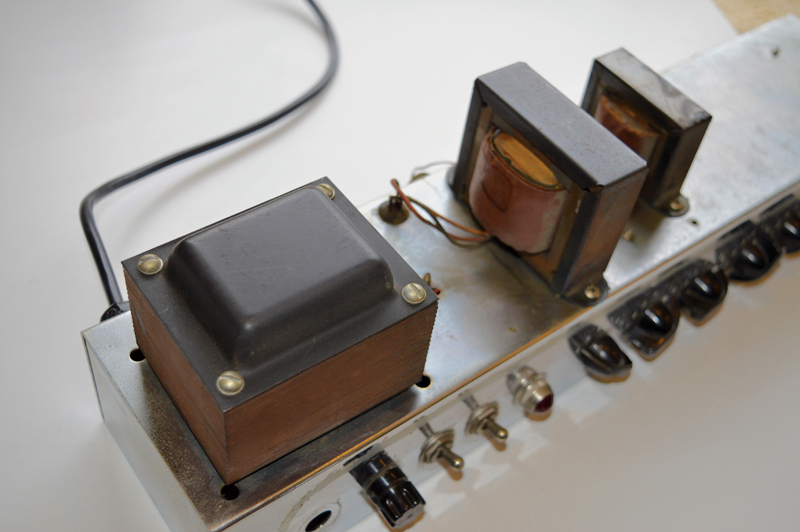 Even so, further research revealed that the high voltages in this amp were pretty standard for a 5E4-A. Ideally, I’d like to be able to keep those beautiful Astron coupling capacitors, but leaky capacitors can degrade tone and damage an amp. To test for leakage, I de-soldered the grid ends of the Astrons then connected each exposed end to ground via a 1M resistor. The grid ends of these Astron coupling caps were lifted to test for leakage. They all turned out to be leaky and were replaced. A digital multimeter can then be used to read the voltage across the 1M resistor, and if you see one volt or more, you can conclude the cap is leaky and should be replaced. All the Astron coupling caps in this amp were very leaky. I own a device that tests capacitance value and leakage of electrolytics. Since it tests for leakage only at very low voltage rather than the high voltages found in valve amps, I take the readings with a pinch of salt. However, it can tell me if an electrolytic capacitor value has drifted and by how much. 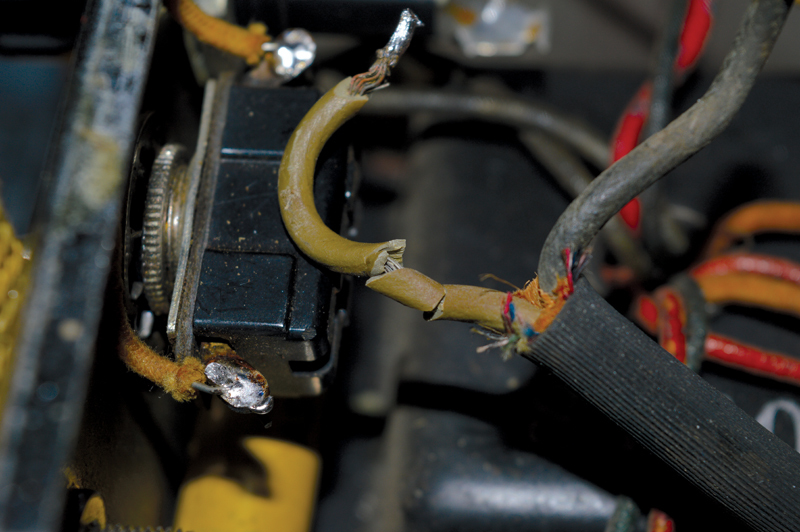 You should never test electrolytics without first disconnecting the amp from the mains and discharging all the capacitors. Of the three filter caps that came with the amp, only one was original, and that was showing signs of blistering. The grey one wasn’t even of the correct value. Since the Astrons were all being replaced, we decided to swap out the electrolytics too. Naturally, the original components would be kept safe in case a future owner might want to reinstall them, but keeping Ed safe was my priority. Incidentally, I asked Joe Bonamassa if he thought running vintage Fender amps night after night on tour was a bit risky. Apparently, once his vintage tweeds have been restored with modern capacitors and so forth, he has found them to be more reliable than any clone or reissue. Ed intends to gig with his Super, so renewing components was an easy call. The Astron coupling caps were replaced with the same Tube Amp Doctor (TAD) paper/oil caps I used in Ed’s Vibrolux. I have always been happy with Sprague Atom electrolytics, but the TAD electrolytics had garnered some positive reviews and were much cheaper. Having been pleased with the paper oils, I decided to give the TAD electrolytics a try. I started by swapping out the Astrons and the preamp electrolytics, then I took a listen. 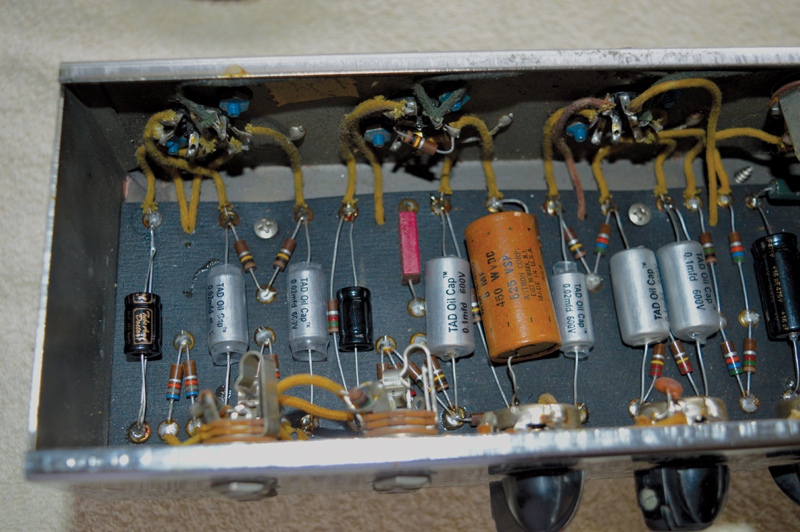 The preamp coupling capacitors have been replaced with Tube Amp Doctor paper/oil types, along with the 25uF electrolytic caps that bias the preamp tubes. The orange 8uF capacitor is original and tested well, but that will probably be retired in the near future. The improvement was immediately apparent, with much smoother and creamier overdrive and a sweeter midrange. The edgy treble was also gone, but the Super was still sounding bright and open. I powered down, drained the capacitors and replaced all the filter caps and the bias cap. While I was at it, I replaced the 10K carbon composite resistor in the power supply with a 22-watt wire wound. I figured the original had endured a tough 60 years and deserved a happy retirement. The three black capacitors on the left are 16uF Tube Amp Doctor electrolytics. 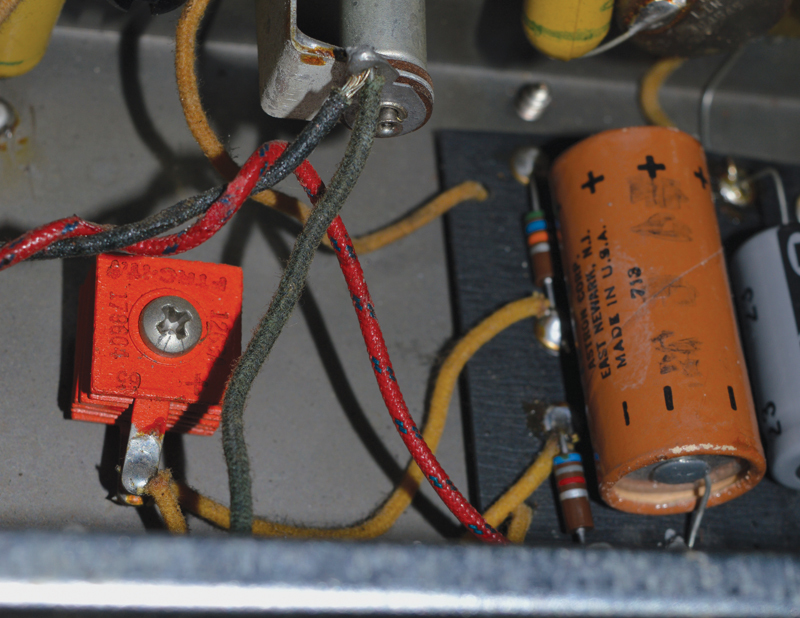 The capacitor on the right is a Sprague Atom 100uF electrolytic in the bias circuit. I tested all the electrolytics when they were removed. None were close to their specified values and two were double. Listening once again, the Super was running quieter and I was really feeling the touch compression that I enjoy from low- and mid-power tweeds. 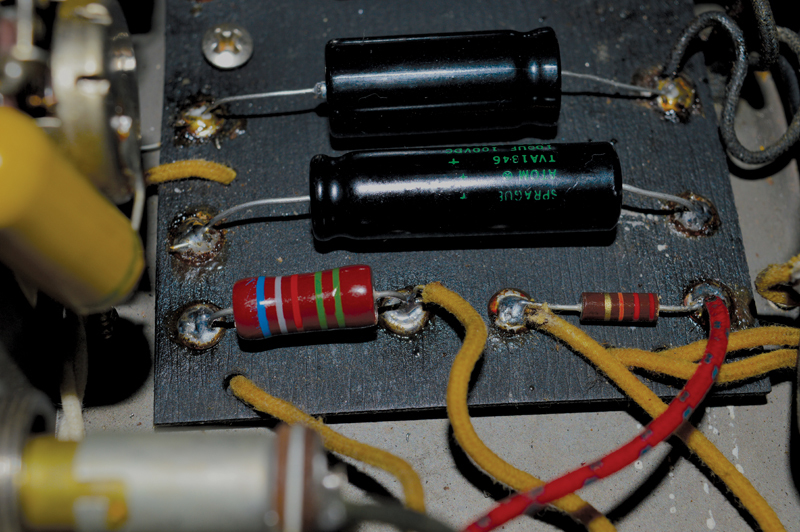 On fixed bias amps, I like to install 1-ohm resistors between the cathodes of the power valves and ground. Measuring the resistance across the resistor gives an indication of how the valves are biased and how closely they’re balanced. 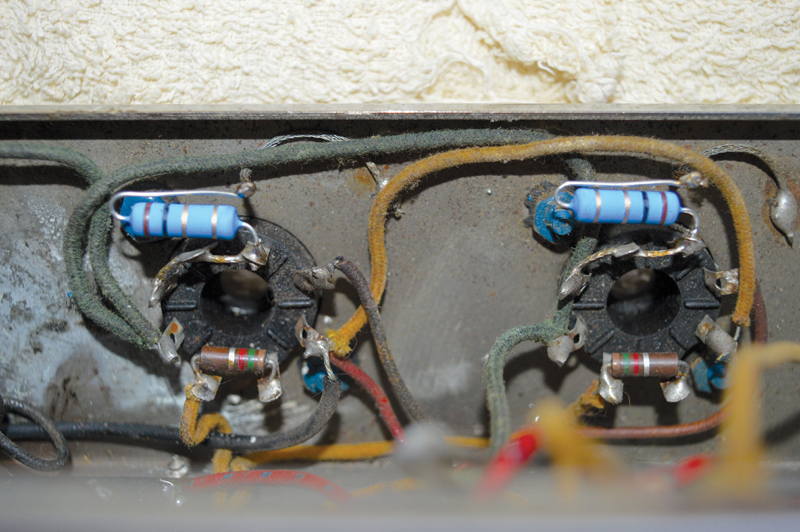 Having installed two 1-ohm resistors, I found the voltages across the cathode resistors were mismatched. The braided wires were snipped close to the solder tags on the valve bases and 1-ohm resistors connected between the cathode tags and ground. The resistors don’t effect the running of the amp, but measuring voltage drop across them will give an idea of the bias setting and how well they’re matched. 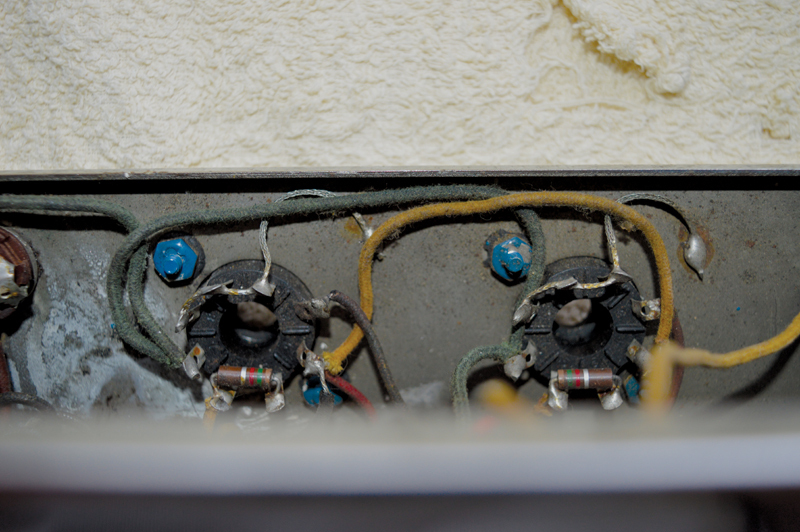 You can leave them in after servicing the amp or remove them. This doesn’t necessarily mean that there’s anything wrong with the valves, but if you swap over the power valves and the cathode resistor voltages move with the valves, you can reasonably assume they’re out of balance. I put in a matched pair and the voltages balanced up, but the plate voltages were still quite high and the bias seemed way off. Rather than swapping the 56K bias resistor, I decided to see what would happen if I replaced the 6K8 resistor that, according to the circuit diagrams, should have been a 22K or an 18K. With a 22K, the 6V6 plate voltages fell to 390v, and all the other voltages were pretty much bang-on throughout the amp. Although I was reading 25mV across the cathode resistors with my own pair of GEC 6V6s, Ed’s Sylvania 6V6s ran a tad hotter at 27mV. I installed a 68K resistor in place of the 56K and all was well. After dialling in the bias and sorting the voltages, the Super sounded sweeter and smoother. The Super has ample treble and bass. It’s chimey, airy, cutting and outstanding with humbucker-equipped guitars. However, the mids sound slightly scooped and some may crave the chewy midrange grind of a tweed Deluxe. Although I have no qualms about swapping tired and potentially dangerous components, I would never drill a hole in a control plate to install a midrange control. I also wanted to avoid messing with the original circuit. 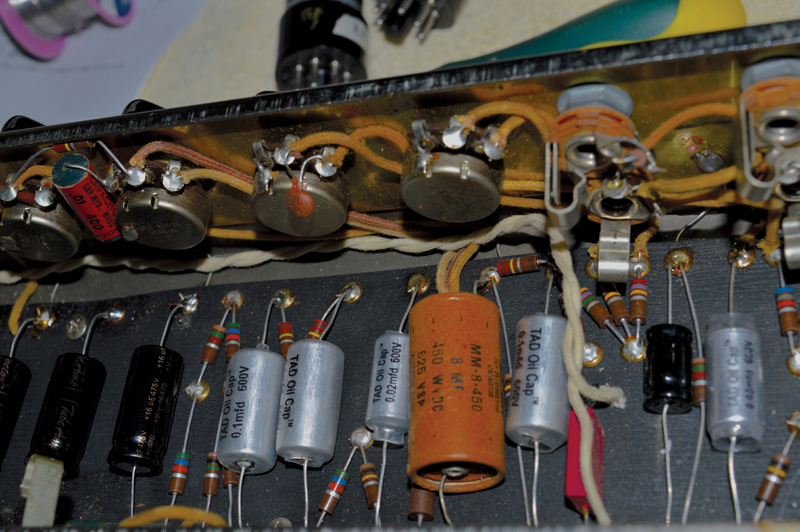 There’s a simple mid-boost modification for Baxandall-type tone stacks such as the Super’s: simply place a 500pF or 1000pF capacitor in parallel with the 0.00025uF capacitor that’s tied to the treble control. I obtained a three-way on/off/on switch and, using two 500v silver mica capacitors, I got two preset levels of mid boost and, with the switch in the centre position, the circuit reverts to stock. 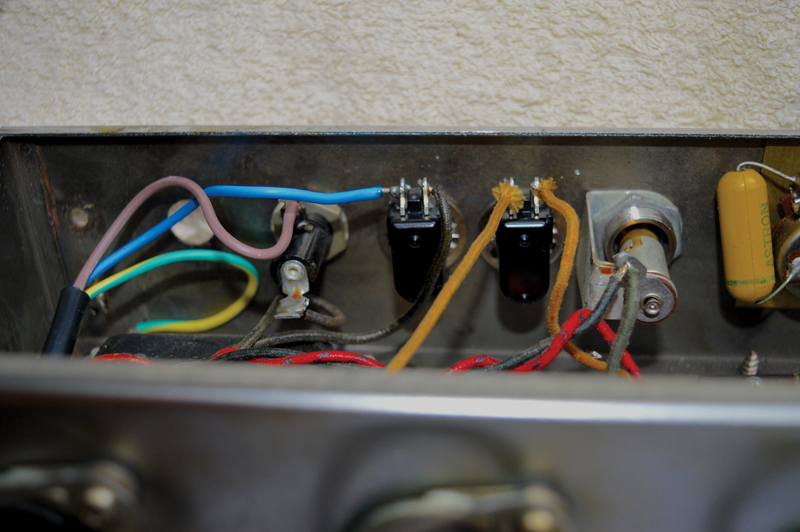 Best of all, the switch can be installed in place of the ground switch, so the amp appears unmodified. A three-way switch with a centre off position was installed in the hole vacated by the ground switch. Make sure the shaft fits the hole properly and the switch can handle the current and voltage. The two wires from the red box cap were twisted together and connected to the centre tag of the switch and capacitors. Having the switch so far away wasn’t ideal, but running the wires adjacent to the board rather than along the top of the control pots and positioning the mains wires well away keeps noise down. 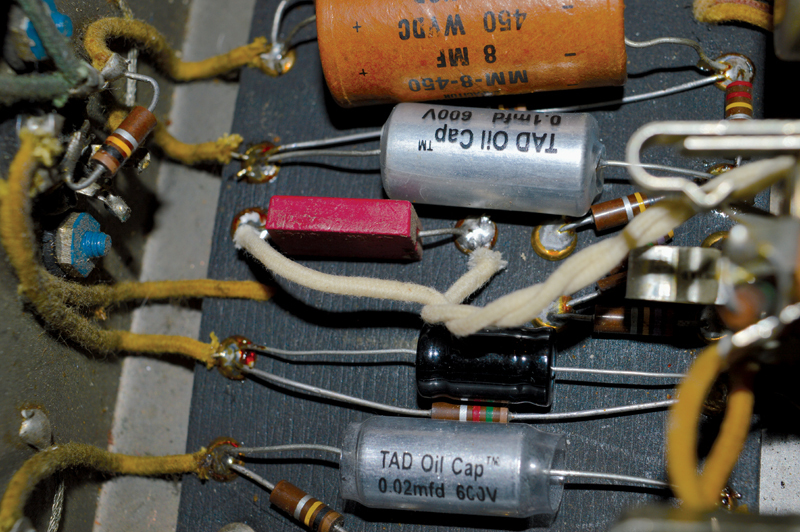 500pF and 1000pF silver mica capacitors were soldered to the outer lugs of the three-way switch and their leadout wires were soldered together. The switch selects two levels of fat boost and the centre position disengages the boost. Re-tweeding a 50s Fender amp is similar to refinishing a vintage guitar. Neither has any effect on tone and both make things much more affordable. Had Ed’s amp remained untouched since it left the factory, the price would have been at least double what he paid. The cost of this Super was more or less in line with that of a brand new amp from a boutique US builder. Various factors contribute to the tone of vintage amps, and I feel transformers, valves and speakers are more significant than capacitors and resistors. 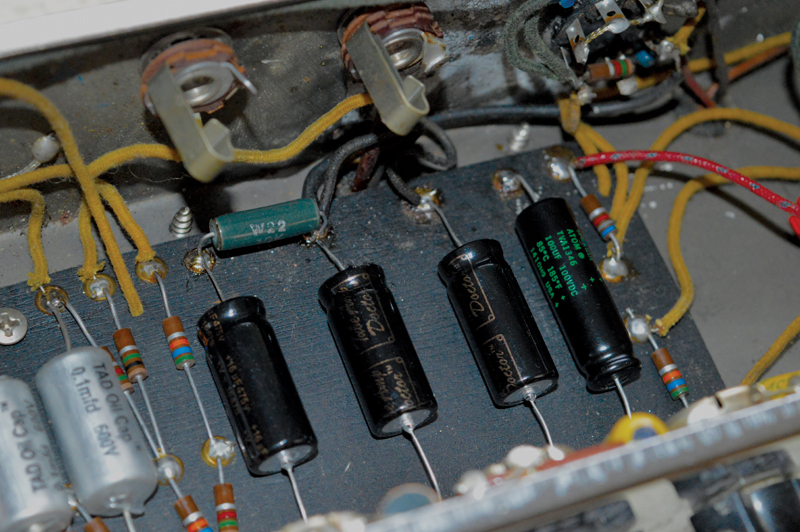 When you consider that capacitor failure can destroy valves and vintage transformers, it seems daft to risk expensive and irreplaceable components in order to preserve cheap electronic components that Leo Fender would have expected owners to change in the course of routine maintenance. With its re-tweed, broken handle and black painted speaker cloth, this electronic restoration is unlikely to have further dented the Super’s appeal to collectors. However, it has radically improved the sound; and now it’s safe to use its owner has no need to feel nervous about gigging with it. After all, that’s why he bought it. I can understand why someone such as Bonamassa would choose to play through a tweed Super. After getting to know this amp, if I could afford any tweed Fender from the 50s I would probably choose a 5E4-A. It has everything I like about medium-power 6V6 tweeds, coupled with extended headroom, tonal range and volume. Even the old Jensens sound fantastic, and with two of them handling the power, they don’t sound loose or overly compressed. This Super is incredibly touch-sensitive and you can get shimmery mid-scooped cleans, creamy overdrive and ferociously fat grind at sensible volume levels. It brings out the best from every guitar you plug into it. Although it needed some work, Ed has got a piece of Fender history that will most likely increase rather than decrease in value as he enjoys using it.